For years, Valve has thrived by taking a 30% cut of all revenues developers bring in through Steam, but the company is facing pushback against that practice from a number of directions lately. Aggressive new challengers like the Epic Games store and Discord store have embraced more developer-friendly revenue splits, big publishers are increasingly willing to launch big PC titles without Steam, and now many developers just don't see themselves getting much bang for the buck on that 30% cut. Negative sentiment aside, Steam was the most popular PC/Mac storefront for developers surveyed, with 47% selling their games through it. The next most-common way for developers to get their games to customers was by selling directly through their own site (26%). Publisher-owned outfits like EA's Origin or Battle.net were collectively used by 18% of respondents, the same amount that reported selling games through Itch.io. After that came names like Humble (17%), GOG (14%), and Discord (6%). The survey also identified some interesting dynamics about where developers' business was coming from. Of the developers who sold their games on Steam, 55% reported that Valve's storefront accounted for 75% or more of their sales. 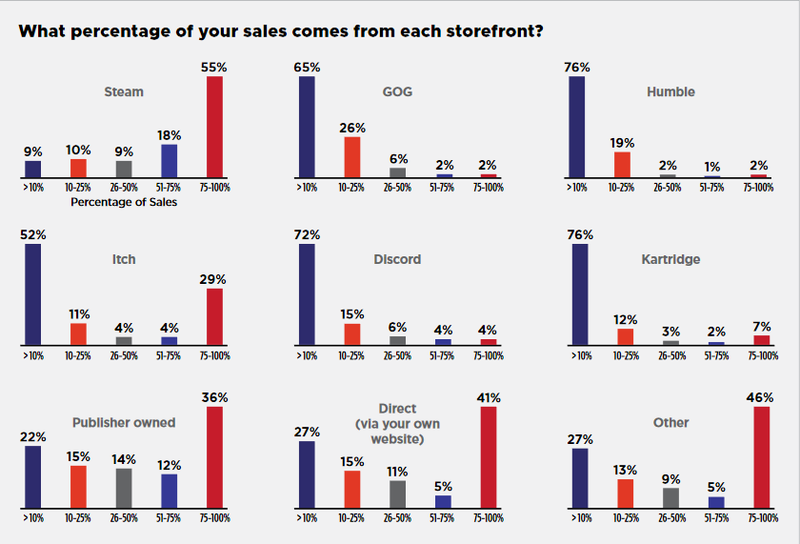 Developers on GOG, Discord, Humble, and Kartridge rarely reported those platforms contributing heavily to sales, with only single-digit percentages of developers reporting receiving more than half their revenue from any one of those stores. However, publisher-owned storefronts (36%), developer's direct sales sites (41%), and Itch.io (29%) more commonly accounted for 75% or more of their games' sales. As for platforms, PC is still dominant, with 66% of respondents currently developing for it. Smartphones and tablets were the next most common platform at 38%, followed by PlayStation 4 and Pro (31%), Xbox One and X (28%), and Macs (20%). Though the Switch trailed at 18%, interest in developing for the handheld hybrid was up year-over-year. 16% of respondents said they were making their next project for current and as-yet unannounced platforms, while 2% said their next game would be exclusively for unannounced platforms. The full State of the Games Industry survey covers a variety of additional topics, including unionization and work hours, and can be downloaded from the official website.